Simplex (Pellini & Ferraris, later Luigi Pellini) is a historic brand of motorcycles based in Torino. The brand that initially made 123 cc two stroke with horizontal cylinder. 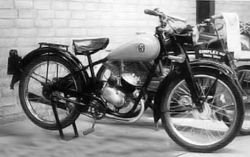 In 1927 was followed by 173 cc and later 246 cc and 346 cc OHV with its own solid motors. After 1945 there were 148 cc to 248 cc OHV albeit in modest numbers were made.